The Philadelphia Eagles defeated theNew York Giants, 25-22, in Week 12 of the 2018 NFL season. Saquon Barkley did Saquon Barkley things, as he was impressive running and catching the ball. He often made defenders miss in the backfield, in the hole, and at the second level of the defense and when he needed to, he put on the jets to outrun them. He’s lived up to the hype. Unfortunately, it does not matter. It was a great game for Eli Manning until the Giants needed him to take or maintain the lead. 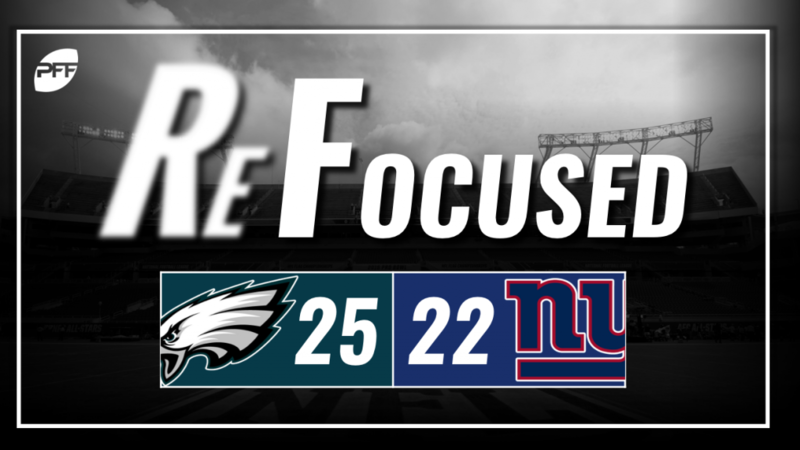 A costly interception at the end of the first half took points off the board and allowed Philadelphia to hang around. Manning connected on just seven passes for 61 yards in the second half, continuing his struggles in 2018. Safety Landon Collins seemed to be everywhere in this game. He made defensive stop after defensive stop and continually disrupted the run game. The Giants linebackers were all over the place in coverage, and that really hurt the Giants as the Eagles feasted with their tight ends and running backs. Alec Ogletree, Tae Davis and B.J. Goodson couldn’t seem to find their covers, as there were plays where they just ran right by their man and left him wide open. Carson Wentz had himself a good day throwing the football, especially when the Giants sat back in coverage. He only missed on a handful of passes, and looked good throwing to the intermediate range of the field. This game wouldn’t have been close if it weren’t for some well-timed sacks or poorly-timed drops. The Eagles’ running back duo of Josh Adams and Corey Clement both played a good game and combined to go for over 125 rushing yards. Adams gained a large majority of his yards after first contact and broke a handful of tackles, while Clement had his big 32-yard run. Having a successful run game seemed to help relax this offense a bit. Malcolm Jenkins put this ragtag group of a secondary on his back and willed the Eagles to victory. He was excellent in coverage all game, often doing his best to cover up busted coverages by the young cornerbacks. On top of his interception, he forced a couple of incomplete passes. Michael Bennett was disruptive against a porous Giants offensive line as he racked up two sacks and multiple pressures. Fletcher Cox also feasted, as he generated several pressures on the game including a quarterback hit. The Eagles’ front seven needs to continue to disrupt the opposing quarterback with the youth they have in the secondary, and this was a good start. New York: Eli Manning’s interception at the end of the half proved costly, and he was never able to recover from it. Philadelphia: Carson Wentz was able to march this offense downfield in the second half thanks to better protection and an effective run game, and he made some nice throws to lead the Eagles to the victory.